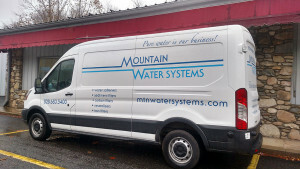 Family in “Fletcher” North Carolina brought in their sample water to our Store for the free test that offer for hard water and also iron water issues. After the results came in from their water quality test, they decided to go ahead and get a water softener for the hard water and a neutralizer for the pH balance issue they were having. So after the install we all went ahead and tested the water with them by drinking it, and they were amazed at the clearness and also the great taste of their well water after the filtration system install. So now they don’t have to worry about the new water heater that they just installed. If You See This Truck On The Highway?